At a brief glance in the supermarket, the Hebrew text might be taken to mean that the product had been inspected for insects. The Hebrew text actually states that the product is in need of inspection for insects. 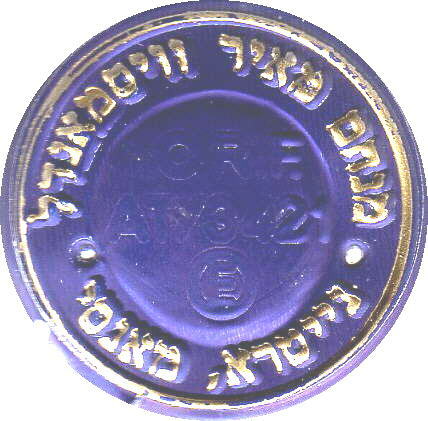 The Alei Katif label is shown here at approximately its actual size of 7.5cm wide. Labels with two or even three hechshers are commonplace but seven are unusual and must surely be a record for the most hechshers on a food label. 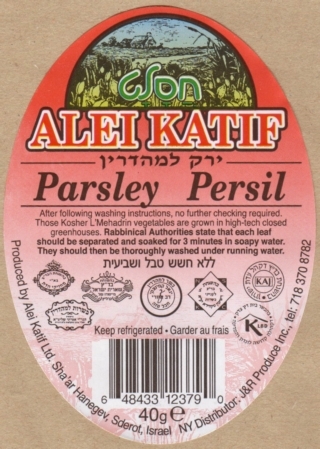 KAJ - Kehilla Adat Yeshurun, Washington Heights, U.S.A.
Dagan Instant Dry Yeast helps to make excellent home-baked bread but don't try to read the two hechshers. On the left is the hechsher of Rabbi Moshe Y.L. Landau, Bnei Brak. On the right, and upside down, is that of Rabbi G.M. Garelik, Milan. TRIVIA: It's not just the occasional hechsher which may be upside down. Upside Down Cakes are delicious - they take the form of a sponge cake covered in sliced fruit. An interesting article by Rabbi Zushe Yosef Blech, eminent in the field of kashrut, may be found at www.alestreetonline.com. Rabbi Blech discusses the chemistry of fermentation and Passover yeast. This design, printed on the back of a greetings card, provides price information. However, it seems unlikely that anyone will attempt to eat the card given its apparently kosher status! O organic free-range eggs: hens are free to roam in fields during the day. Perch in a barn at night. Fed organic feeds. 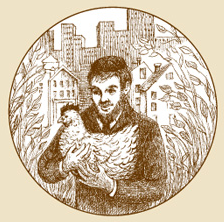 1 free-range eggs: hens are free to roam in fields during the day. Perch in a barn at night. 2 barn eggs: hen lives 24/7 in a barn together with up to 13,000 other hens. 3 cage eggs (battery eggs): hen lives 24/7 in its own cage which is only slightly larger than its body, i.e. an area a bit bigger than your laptop computer screen. 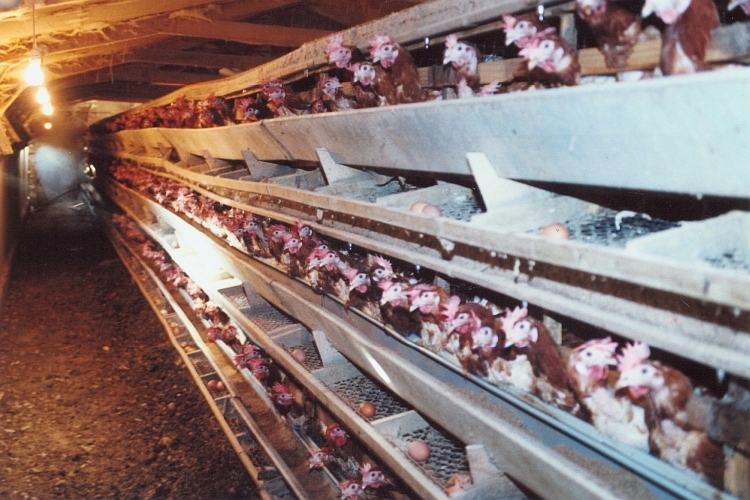 The hens which lay cage eggs and barn eggs are kept in horrible and unnatural conditions. Should we Jews celebrate Pesach and our deliverance from slavery with a cage egg or barn egg - products of slavery - on the seder plate, especially when there is the alternative of Free-Range eggs? Should we eat cage eggs or barn eggs at any other time of year? Whilst on the subject of chickens and their treatment, this may interest you .. The image is copied from a full-page advertisement for "MaxiYums Omega Yums - It tastes yummy!" published on the inside front cover of Kashrus Magazine, No.135, dated July 2007. The product is a fish oil food supplement and the advertisement includes a picture of a young boy and the accompanying text "Build his Brain." It would be reassuring to learn that the product is equally able to "Build her brain" too. The small text of the GMP (Good Manufacturing Practices) logo (3.8mm wide) is too small to read but the "GMP" text is easily readable. The Orthodox Union hechsher (2.4mm wide) due to its simple design elements is legible and easily readable without a magnifying glass. 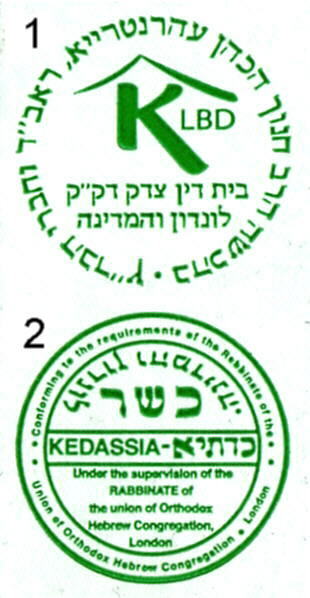 The right-most logo (2.5mm wide) is the hechsher of Rav Shmuel Dovid Krausz, the Udvarer Rav, of Beth Din of Hameyuchud, Brooklyn, New York. It is illegible at any magnification. Most wine bottles are sealed with a plastic heat-shrink capsule. 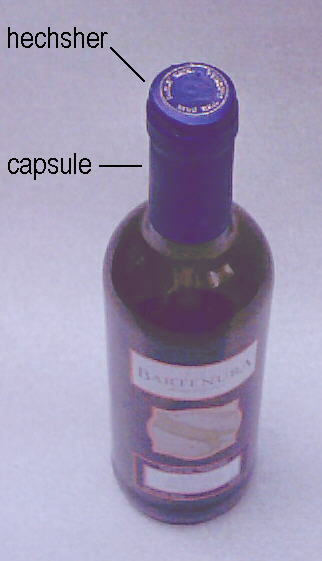 In the illustration opposite the deep-blue capsule on the half-bottle of Bartenura Moscato 2005 has embossed on it in gold lettering the hechsher of Rabbi Menachem Meir Weissmandl of Nitra-Monsey, NY, U.S.A. The main bottle label, composed of three separate labels, bears the OU hechsher whilst the "rear" label bears the hechsher of Rabbi G.M. Garelik of Milan, Italy. Tasting note: delicious white wine with a slight fizz and a flavour described as peachy. Best when chilled. There are several examples of badly printed hechshers elsewhere on this web-site. Here is an example of good printing which proves that printed Hebrew, especially at very small font sizes, can be legible. The actual line height of each of the two sentences in the middle is only about 0.6mm, yet the ink has not degenerated into illegible blobs. The image, shown here magnified about 6x, is from a tube of Colgate Fluoride Toothpaste. The hechsher is that of the Manchester Beth Din, U.K. 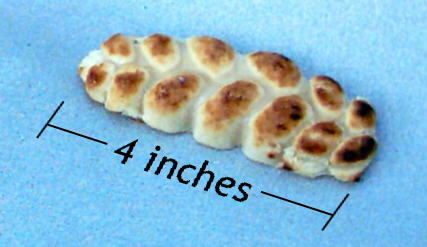 This Kedassia hechsher is shown here approximately twice actual size. The diameter of the printed original is 11.0mm. At a glance the hechsher looks like a Kedassia hechsher but apart from its general appearance there is nothing else to identify it positively. These delicious little chocolates resemble seeds and bear the Kosher L'Pesach hechshers of the Orthodox Union and Rabbi Yechiel Babad, the Tartikover Rav. 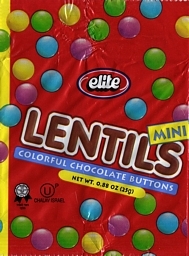 The product is manufactured by Elite Confectionery of Nazareth-Illit, Israel. My enjoyment of a large slice of kosher cake at the Jewish Book Week 2006 exhibition in London was heightened by an unexpected bonus; a hechsher with a typographic malfunction. The hechshers of the London Beth Din include the words , 'london v'hamedina' or London and the Region. See the lower horizontal line of text in hechsher no.1. 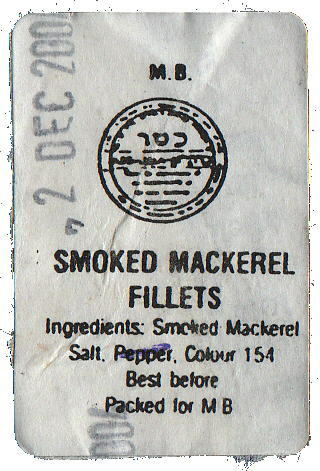 Both hechshers were printed on the same paper seal on the wrapping of cake supplied by DD's Kosher Sandwiches Ltd, London. 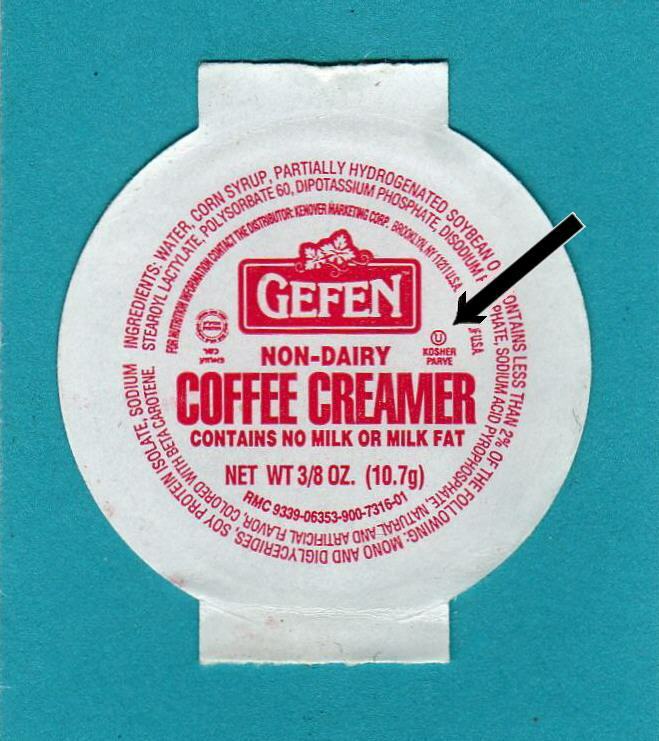 There are two tiny hechshers displayed on this GefenÂ® Coffee Creamer label which was used to seal the small plastic container supplied to me as part of a kosher airline meal in March 2004. The smaller of the two hechshers is indicated by an arrow and is that of the Orthodox Union OU. Its diameter is only 1.0 millimetre. For comparison I measured the diameter of the heads of fifteen one-inch (25mm) pins used in sewing. The average head diameter was 1.7 millimetres. Thus one OU hechsher may fit onto the head of a pin with plenty of space left over for as many angels as might care to dance there. diameters and calculated the average diameter with Lotus 123.
dimension readable under 8x magni- fication? You saw it here first! 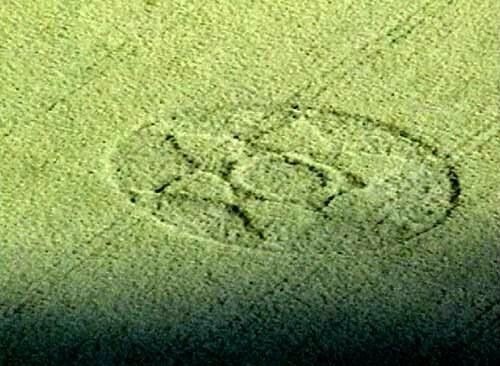 The hechsher of an unidentified kashrut authority imprinted upon a crop of wheat. It is not known whether the hechsher certifies the field or the whole of Canada. The world's smallest "challah bread"
Despite its mouthwatering appearance it's not actually a real challah. It's made of marzipan by Oppenheimer (1998) Ltd of Jerusalem and the wrapping bears the hechshers of the Chief Rabbinate of Jerusalem and of the Beth Din Tzedek of the Chareidi Community, Jerusalem. for alerting me to this product. The meaning of the apparently conflicting statements in (1) and (2) is that if you are a Sephardi Jew then you may eat the [delicious] sauce during Passover. If you are an Ashkenazi Jew then you may not. 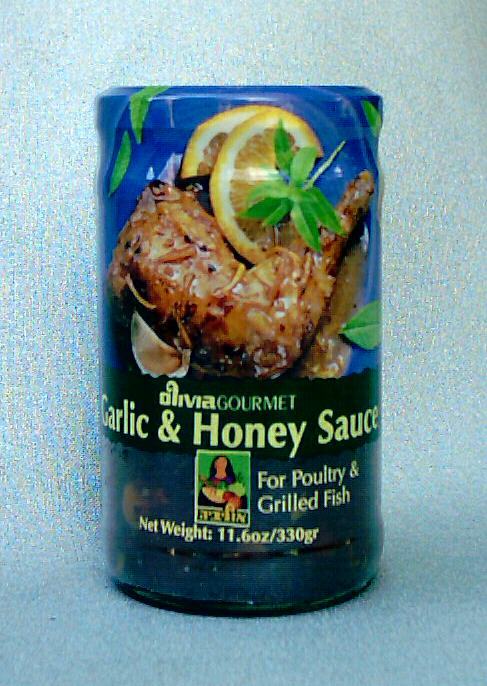 It raises a question concerning the completeness of "Kosher for Passover" kashut advice. Not all of us grocery shoppers are familiar with the subtle nuances of kashrut jargon. The meaning of "Kosher for Passover" depends upon whether the kashrut authority is Sephardi or Ashkenazi. Should a hungry Passover eater need to enquire into the kashrut orientation of a kashrut authority before deciding to eat or not eat? The package contains five spherical hollow bubble gums in various bright colours. Each bubble gum is pierced by a single hole: follow the arrow for an example. "Whistler's Whistle 'n Chew" bubble gum, whilst not actually a meal item, is kosher, edible and ingenious in its design. It also provides some energy due to its sugar content. The inventors combined the notion of bubble gum and a hollow sphere pierced by a single hole. If one blows across the hole, as one might blow across the mouthpiece of a traverse flute or the opening of a narrow-necked bottle, then a shrill whistle ensues. This product is the result of inspired lateral thinking, or, thinking outside the box as our American friends might say. The bubble gum is manufactured by Concord Confections Inc. of Canada and bears the hechsher of Bloomy's OU Kosher. This is not a kosher product. 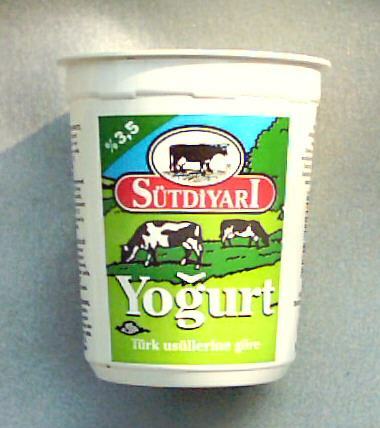 It is yoghurt which was manufactured in Denmark for sale through Turkish grocery shops. The ingredients list obligingly states that the yoghurt contains beef gelantine which is kosher. 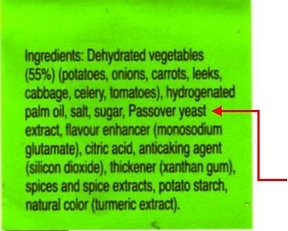 It is difficult to understand why a manufacturer would select a kosher ingredient for a product which would never be eaten by Observant Jews. , i.e. kosher beef gelatine. In October 2006 Zev Sero wrote: You are wrong. Going by the ingredients alone, this product may very well be kosher (at least for those who don't require in-person Jewish supervision on the milk). 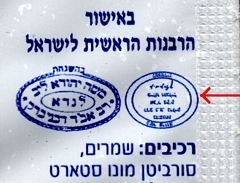 Kosher beef gelatin (made in the USA under the brand name Kolatin) is parve [a beef gelatin made from Glatt Kosher beef hides which are not considered to be meat], and there is absolutely no reason why it could not be used in chalav yisrael yoghurts and advertised as kosher limhadrin min hamehadrin. 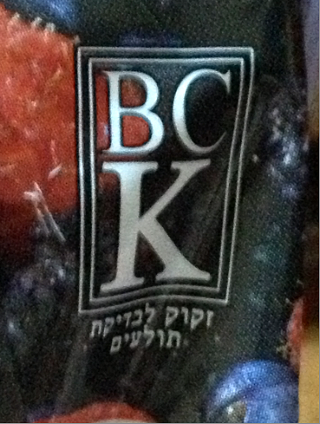 This particular yoghurt may be produced under a hechsher which isn't printed on the packet, as is the case with many products in Europe, in which case it is a kosher product. In fact, since kosher gelatin costs more than normal gelatin, I rather suspect that it does have a hechsher of some kind, which is simply omitted from the Turkish packaging. A description of these matters may be found at http://www.kashrut.com/articles/DryBones/. Kolatin as referred to above is entirely different to kolatin which is a crystalline substance derived from kola seeds. 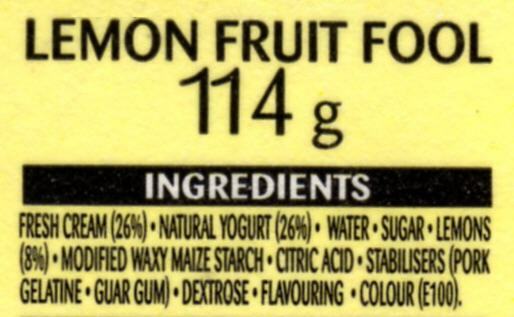 A different non-kosher product, a "lemon fruit fool" marketed by Morrisons Supermarkets in the United Kingdom, contains pork gelatine although you may have difficulty reading the list as printed on the container because of the small narrow typeface. DEFINITION: A fruit fool is made from crushed fruit, lightly stewed and mixed with cream and sugar.